This page has been visited 14042 times since July 28, 2008. 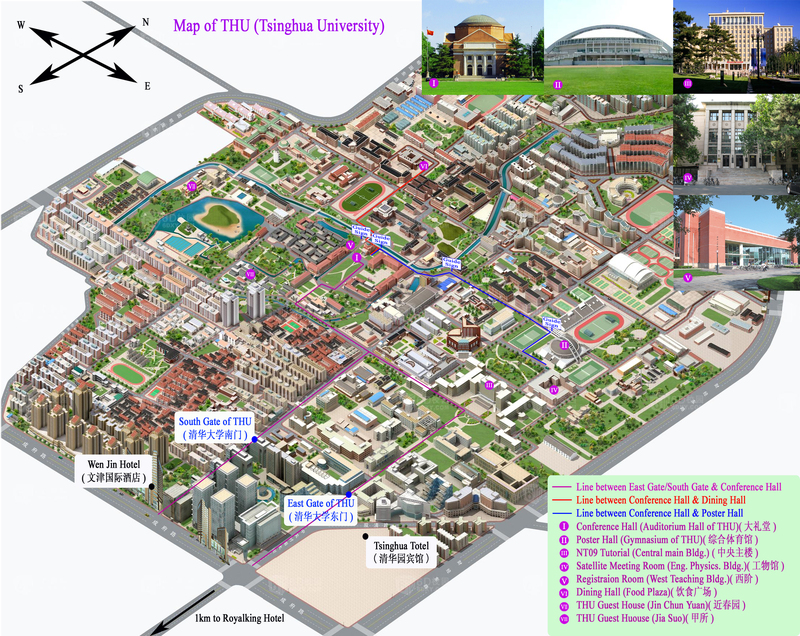 The NT09 Conference will take place on the campus of Tsinghua University in Beijing, China. Most participants will arrive by air at the Beijing International airport (BJS). 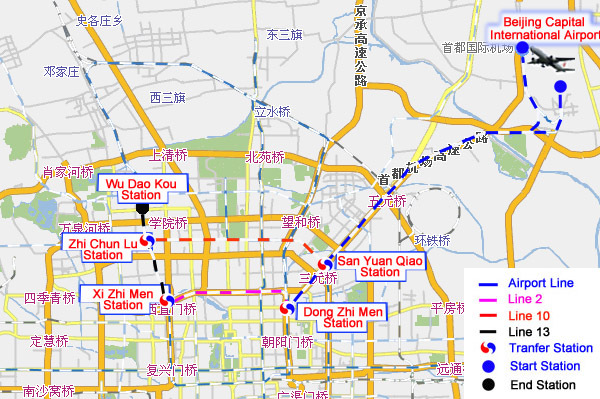 Beijing has an extensive public transportation network. Subway and City Rail with high speed trains running at intervals of 3 to 5 minutes are the fastest public transportation in the city. Public buses are the cheapest means of transportation that covers the entire city. The starting fare of public buses is 1 CNY in the city and 2 CNY in suburb areas. Beijing Subway fare is 2 CNY on different lines. In addition to the buses, subways and city light rails, the taxis are also available in Beijing. The cheapest price for a taxi ride is 10 yuan for the first 3 km distance and the price after 3-km ride is 2 CNY/km (5:00 AM-10:59 PM). The cheapest price for a taxi ride is 11 yuan and the price after the 3-km taxi ride is 2.4 CNY/km (11:00 PM-4:59 AM). Please remember to keep your taxi ticket in case that you forget any things on the taxi. The ticket is helpful to find the taxi drivers. Beijing Capital International Airport is in the northeast of Beijing. 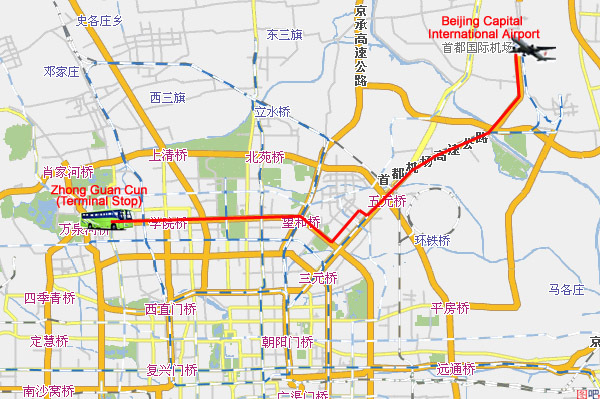 The distance from Beijing Capital International Airport to Tsinghua University and your accommodated hotels is about 32 km. You can take a taxi, the airport shuttle bus, or subway to Tsinghua University and the hotels. We recommend transport by taxi (easiest way) or by airport shuttle bus (easier and cheaper). The taxi ride takes about 40 minutes. The taxi fare is around 100 CNY (5:00 a.m.-10:59 p.m.) and 150 CNY (11:00 p.m.-4:59 a.m.). The bus ride takes about 50 minutes and costs 16 CNY. Take the Airport Bus to the "Zhong-guan-cun" terminal. The bus operates between 8:30 a.m. - 9:30 p.m. every day at 30 minute intervals. From the terminal station, a taxi ride costs around 10 CNY. Take an airport subway to the terminal (Dong Zhi Men Station), the fare is 26 CNY. Then change to Line 2 to Xi Zhi Men Station (2 CNY). Change again at Xi Zhi Men Station to Line 13 to Wu Dao Kou Station. Take an airport subway to the San Yuan Qiao Station, the fare is 26 CNY. Then change to Line 10 to Zhi Chun Lu Station (2 CNY). Change again at Zhi Chun Lu Station to Line 13 to Wu Dao Kou Station. 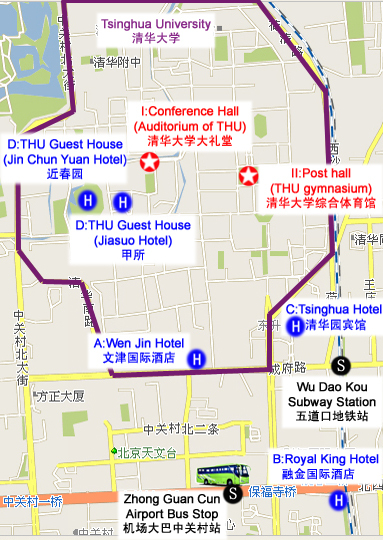 From Wudaokou Station, you may walk or take a taxi to Tsinghua University or the hotel, the distance is around 1 km. The entire trip takes about 60 minutes. 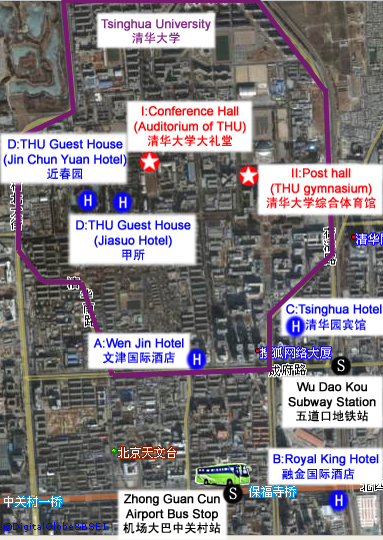 Conference Hall, Post Hall and THU Guest House are in Tsinghua University, and other hotels is around but near Tsinghua University, which is near Zhong Guan Cun Bus Stop and Wu Dao Kou Subway Station. Generally, transfer between the places by taxi is about 10 CNY.